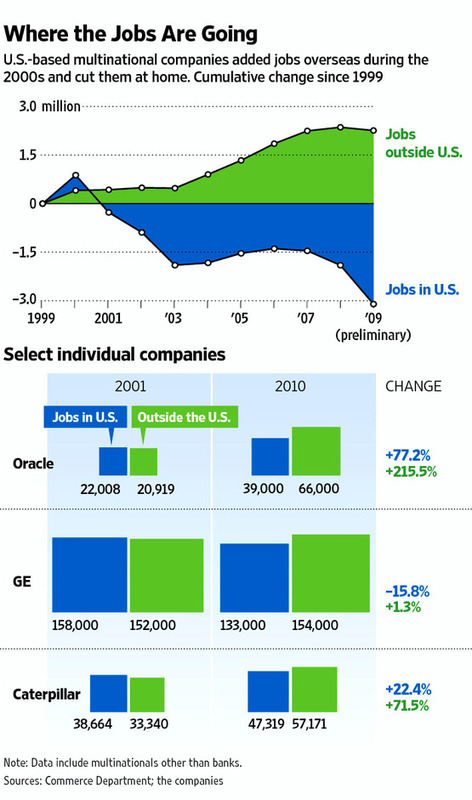 Some fascinating statistics in this WSJ story, showcasing what an effect the hemorrhaging of jobs out of U.S. multinationals has had on the economy, and why we've staggered through 2 jobless recoveries the past decade. Essentially there has been a 4 million job swing from this group of companies since year 2000 - from a ~+1M net positive, to a -3M net deficit. In a static world if we added back those 4 million jobs, the 13.5M-ish "officially" unemployed Americans would drop to 9.5M-ish, and the "official" unemployment rate would be a more palpable 6.2%. (Of course the official figures have been made much more positive by a series of adjustments in record keeping the past 2 decades) Looks like that 'crazy' Ross Perot was correct about the "great sucking sound" he warned about almost 2 decades ago. Looking at some data from the Bureau of Labor Statistic, the number of jobs multinationals now offer in the U.S. economy (21.1M) is barely above the the number of government jobs (20.8M). Just imagine how much lower our fiscal deficit would be if we could outsource government jobs to Chindia too! U.S. multinational corporations, the big brand-name companies that employ a fifth of all private sector American workers, have been hiring abroad while cutting back at home, sharpening the debate over globalization's effect on the U.S. economy. The companies cut their work forces in the U.S. by 2.9 million during the 2000s while increasing employment overseas by 2.4 million, new data from the U.S. Commerce Department show. That's a big switch from the 1990s, when they added jobs everywhere: 4.4 million in the U.S. and 2.7 million abroad. In all, U.S. multinationals employed 21.1 million people at home in 2009 and 10.3 million elsewhere, including increasing numbers of higher-skilled foreign workers. The data also underscore the vulnerability of the U.S. economy, particularly at a time when unemployment is high and wages aren't rising. Jobs at multinationals tend to pay above-average wages and, for decades, sustained the American middle class. Some on the left view the job trend as reason for the U.S. government to keep companies from easily exporting work overseas and importing products back to the U.S. or to more aggressively match job-creating policies used in some foreign markets. More business-friendly analysts view the same data as the sign that the U.S. may be losing its appeal as a place for big companies to invest and hire. The growth of their overseas work forces is a sensitive point for U.S. companies. Many of them don't disclose how many of their workers are abroad. And some who do won't talk about it. While small, young companies are vital to U.S. economic growth, big multinationals remain a major force. A report by McKinsey Global Institute, the think-tank arm of the big consulting firm, estimates that multinationals account for 23% of the nation's private-sector output and 48% of its exports of goods.